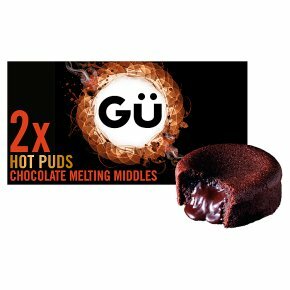 Caution: the puddings can be very hot. Don't overcook them, or they'll lose their Gü-ey centres! (800W): Heat one at a time. Remove from paper case and place on a microwavable plate and heat for 30 seconds, no longer! Remove paper cases and place on a baking tray in a pre-heated oven at 180°C (gas mark 4) and cook for 10 minutes. Don't overcook them, or they'll lose their chocolate lava centres! Using a cake slice, carefully lift the Gü-ey pudding on to a serving plate.